For people with poor credit, scouring the Internet for a loan offer to suit their needs can be a daunting task to say the least. It can be difficult to understand the terms and conditions of many lender sites, not to mention trying to discern which offers are legitimate and which are scams. Bad Credit Loans takes the confusion out of the equation by doing all the heavy lifting. Once the short loan request is filled out on the site, a network of lenders reviews the request and makes an offer. The service is free, and customers are not obligated to accept any loan offer, which makes Bad Credit Loans an easy, commitment-free resource for those with poor credit needing financial assistance. Bad Credit Loans connects consumers with a large network of reputable lenders. Once the loan offer is accepted, the lender will present a repayment schedule that allows customers to repay their loan over time instead or all at once. Bad Credit Loans requires no collateral, and no one is denied based solely on poor credit history. A steady income and an active checking account are the only security that lenders typically require. Personal loans intended to help in times of need are the principal type of loans offered by the site. BadCreditLoans.com advises that a bad credit personal loan “is not meant to be used for anything other than emergencies” and “is not the best way to get money for something less important, like a new TV.” Taking out a loan in a non-emergency situation can compound some of the issues that caused a person to have poor credit in the first place. Bad Credit Loans also has access to a network of lenders for small business loans. Business owners are often faced with the challenge of getting their new ventures off the ground while shouldering the burden of having bad credit. Bad Credit Loans understands that many banks are reluctant to offer assistance to businesses until they are well established. Bad Credit Loans steps in to process loan requests faster than banks and offers repayment options that are flexible and reasonable, allowing small business owners to focus on building their brand instead of coming up with money to buy needed equipment or meet payroll. 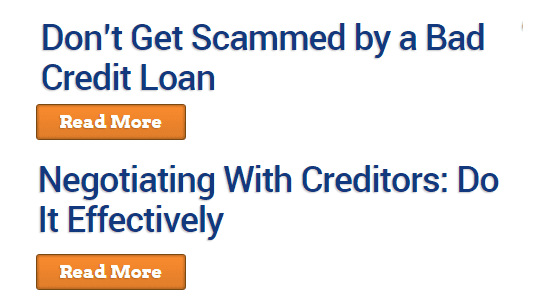 Another noted difference from the banks is that Bad Credit Loans does not require collateral of any kind. The online loan request form speeds up the process because fewer people are involved, and the network of lenders means that the interest rates can be surprisingly low. Bad Credit Loans connects consumers to the funding they need, from auto to mortgage & business loans. While credit cards can be a source of financial health, they can also create problems for those with bad credit. Oftentimes, the inability to pay down a credit card balance is the very source of someone’s credit woes. And with fewer and fewer businesses accepting checks, credit cards are often necessary to pay for goods and services. Bad Credit Loans helps connect those with bad credit to cards that allow them to access the credit they need without risking any further damage to their already poor credit rating. Secured cards are available and are often issued by banks or credit unions. These cards require individuals to open an account with the institution and deposit funds into the account. This money is held as insurance by the bank in the event that the bills cannot be paid. However, secured cards can carry high fees, so these should be considered carefully. All major credit card companies, like Visa, MasterCard, and Discover, issue credit cards to consumers with bad credit. These companies report to credit bureaus on a monthly basis, which means that those with bad credit can begin to quickly repair their credit rating while working their way out of debt. Bad Credit Loans’ offerings extend beyond connecting people with bad credit to lenders. The site’s blog is an excellent resource for consumers to get sound advice on finances. To many seeking guidance on financial decisions, basic Google searching can yield an almost dizzying, and often confusing, amount of information. The blog provides articles written by experts on a variety of important topics to help sort through it all. The Bad Credit Loans blog is a valuable resource for those with poor credit looking for financial assistance. For example, a recent blog post tells consumers how to distinguish financial predators from legitimate lenders. Knowing the difference between valid bad credit offerings and outright predatory scams can be very difficult, and Bad Credit Loans seeks to educate borrowers on how best to stay safe. Bad Credit Loans also offers insightful articles on saving money, buying a home, rebuilding credit after claiming bankruptcy, tips to paying off loans on time and much more. As a trustworthy consumer advocate, Bad Credit Loans has an unwavering policy of connecting people with responsible lenders. By providing necessary information that borrowers need to make educated decisions, Bad Credit Loans protects them from illicit lenders who engage in unfair or unethical practices. Moreover, the lenders in Bad Credit Loans’ network adhere strictly to the most important federal regulations designed to protect borrowers. Fair lending laws like the Dodd-Frank Wall Street Reform Act, the Fair Debt Collection Practices Act, and the Truth in Lending Act all offer borrowers with the security they need to begin getting their credit scores on track for a more assured financial future. Statistics show a vast number of Americans are living with subprime or no credit. And when emergencies arise, Bad Credit Loans can connect them to the reputable help they need.